Google officially announced its long-rumored revamp of its photo-sharing service, Google Photos, at its I/O developer conference in San Francisco today. The killer feature? Users can now backup up full-resolution photos and videos – up to 16MP for photos and 1080p for videos – to Google’s cloud for free. The service will roll out to Android, iOS and web users starting today, the company says. The free storage option makes more sense for those with point-and-shoot cameras, and lets you keep a copy of your photos that’s good for your typical printing and photo-sharing needs. However, those with DSLR cameras or who want to store their photos and videos in their original sizes can choose a different plan which taps into your Google Account’s 15 GB of free storage. This is what was available before, and you can add to your storage quota as needed for a fee. We had been hearing for some time that Google would break out Photos from Google+, where it was previously more of a feature within the larger social networking site rather than a standalone product. With the relaunch of Photos, which will now be available from any device, Google wants to provide a way for users to privately and securely back up and share their photos from a single destination. As before, the photos you snap using your mobile phone’s camera are automatically backed up to Google Photos using the new app, which displays the most recent photo at the top of the stream. The app also lets you sort your photos by day, or even scroll back through the months or years. While the app looks a lot like an improved version of your phone’s native photo gallery at first glance, the images themselves are not actually being stored on the device. That saves space on mobile phones’ sometimes limited storage. Google claims that photos will still load fast, however, making it seem as if they’re stored locally. The app also highlights Google’s machine learning capabilities better than it did when it was part of Google+. Many users weren’t aware they could search their photos on Google+ for persons, places or things, but the new Photos app calls this out more visually in its user interface. This feature means that you’ll be able to more easily find specific photos – whether it’s a dog, your kid’s birthday, your beach vacation, and more – without having to first tag or organize photos into albums. This ability to understand and locate photos by what’s in them directly competes with the new photo sorting and search features Yahoo’s Flickr recently debuted – something which has gotten it in hot water, however, as its auto-tagging capabilities have been a little rough around the edges. 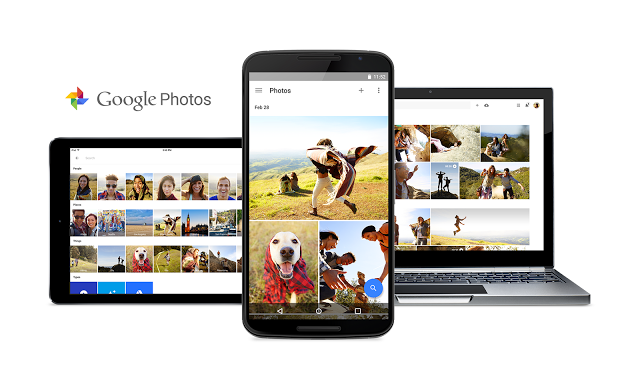 As before, Google Photos will also help users do more with their photos without requiring them to manually create things like collages. The new app will build videos and collages for you, and with a swipe to the left, an “Assistant” feature will appear to offer suggestions if you need inspiration. For example, it might suggest you build a montage of your recently uploaded GoPro video, or a timelapse of recent photos. Essentially, this is an update on Google+’s earlier “auto awesome” feature, though with an improved interface. In addition to collages, Google Photos can also help you build GIF-like animations, movies with soundtracks, and more. After selecting your photos, you’ll be given a link that lets you share photos with others however you choose – the sharing interface lets you copy the link, email it, text it, or share to a variety of social services, including Facebook, Twitter, Google+ and more. Anyone on any device can access the link, and even download the high-quality images you’ve shared.